French President Emmanuel Macron is interested in being a significant factor in the efforts to secure Israel-PA peace. France is expected to propose a new plan for a peace agreement between Israel and the Palestinian Authority (PA), an official in Paris said Saturday night. The comments came ahead of Prime Minister Binyamin Netanyahu's trip to France, where he will mark the 75th anniversary of the Vel d'Hiv roundup, where more than 13,000 Jews were arrested and sent to extermination camps. Netanyahu is also expected to meet one-on-one with French President Emmanuel Macron. 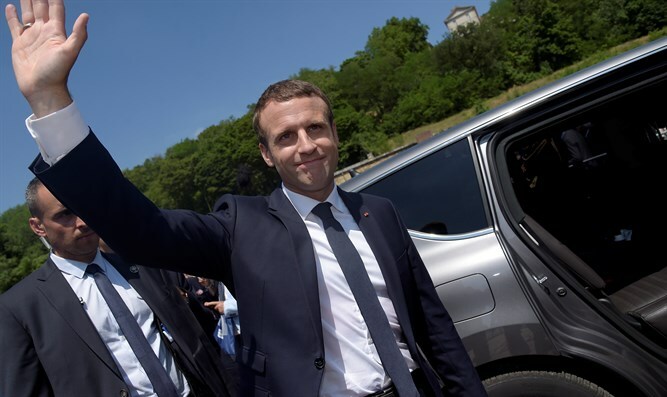 A French official said on Saturday night that Macron is interested in being a significant factor in the attempts to renew talks between Israel and the PA, and that the French are working on their own peace plan. Macron's predecessor, Francois Hollande, initiated an international peace conference in which representatives of dozens of countries urged the two sides to commit to a two-state solution. It is unclear whether Macron's initiative is a continuation of Hollande's initiative, which Israel rejected. "Macron will explain to Netanyahu that France is interested in ensuring the safety and security of Israel, but will express dissatisfaction with settlement construction," the French official said on Saturday night. The official added that the Iranian issue will also be a central point of the talks between Netanyahu and the French president, and added that Macron will declare that his country does not tolerate Iranian extremism whatsoever.